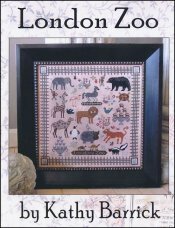 London Zoo [D8838] - $18.00 : Yarn Tree, Your wholesale source for cross stitch supplies. Cross stitch pattern by Kathy Barrick. Zoo animals including an elephant, bear, giraffe, and lion are surrounded by a fencing border. "London Zoo" is stitched at the bottom. Stitch count 243 wide x 243 high.